Second-half goals from Marouane Fellaini and Apostolos Vellios condemned Bolton to their 10th league defeat of the season. The home side were reduced to 10 men after just 20 minutes when David Wheater was sent off for a challenge on Diniyar Bilyaletdinov. Fellaini broke the deadlock when he got on the end of a cross from Leighton Baines to poke home from close range. Vellios then made sure of the points by smashing home from six yards out. It could have been so much more convincing for David Moyes' side, who at times struggled in front of goal. Tim Cahill was, once again, guilty of spurning chances but in the end it did not matter. 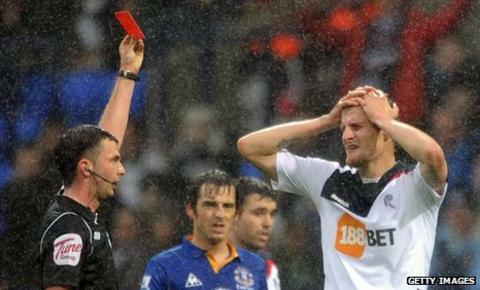 It was never going to be easy for Bolton, who, before the match, had lost five of their last six home games. The task got even harder when they were reduced to 10 men when Wheater was sent off for the second time this season. A poor touch by the former Middlesbrough defender took the ball away from him and he jumped in on Bilyaletdinov on the halfway line, leaving referee Michael Oliver no option but to show the red card. Mark Davies was the man who moved into defence, which allowed the visitors free rein in midfield. Despite dominating the possession, though, Jussi Jaaskelainen was forced into just one save before the break. A well-worked free-kick on 37 minutes saw Johnny Heitinga curl a low effort around the wall but the Bolton keeper got down well to his left to make the save. Whatever Moyes said at half-time did the trick because it took just four minutes for his side to break the deadlock. Leon Osman moved the ball out to Leighton Baines on the left and he played it in first time. Fellaini got ahead of the Bolton defence to poke home from close range for his first Premier League goal of the season. The visitors continued to press, with Baines causing Wanderers all sorts of problems down the left. Bilyaletdinov also went close but he could only drive straight at Jaaskelainen, before Louis Saha shot straight down the throat of the Bolton keeper. At the other end the home side created their best chance of the match, when Mark Davies played a lovely through ball for Ivan Klasnic. He got the better of his marker but Tim Howard stood firm and saved with his feet. That chance proved to be their last real hope as Everton went in search of a second goal, only Jaaskelainen preventing them from adding to their tally. The Finn made a good double save on 71 minutes, first blocking a shot from Cahill before recovering to make a second save from Saha with the rebound. It was all over for Bolton with 12 minutes to go when Everton doubled their lead courtesy of Vellios, on as a second-half substitute. Baines was again the provider as he hit a long pass for Cahill at the far post. The Australian hooked the ball back across the goal and Vellios, arriving from the left, fired home. Bolton boss Owen Coyle: "David took a bad touch, there is no getting away from that, and he tried to recover it. "I think the rules are in place that if your studs are showing, you leave yourself wide open to a red card and watching it in real time, I certainly feel he did lead with his studs. "If he has caught the lad, then the referee is in a difficult place with regard to the rules, which they have to abide by." Everton manager David Moyes: "We have been slow starters in the past, although I didn't actually think we had started slow this year. "We lost the first game, but we got a few points on the board. "Then we had a run of fixtures with a lot of the big teams in a row, but I hope this is the start of us picking up, because we normally do and when we do, we tend to stay on it and go with it."